In a different world, every aspect of the O.J. Simpson trial could have been its own miniseries. But, The People v. O.J. 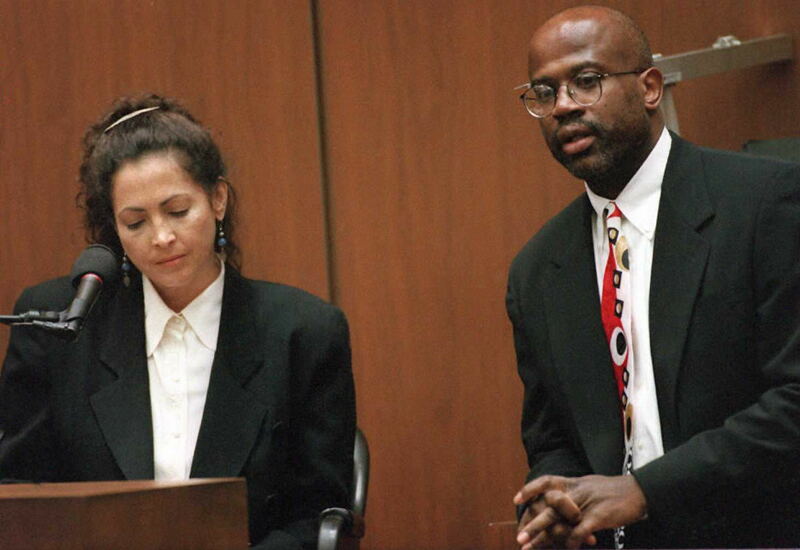 Simpson: American Crime Story wisely chose to focus mostly on the trial, without straying too far into the sometimes over-the-top backstories of everyone involved. But, it makes you curious about everything the show couldn't cover. So, who is Laura Hart McKinny, the witness who will be introduced in this week's episode of the FX series? In an interview with Bustle, she explains what McKinny explains how 20 years after gaining national attention during the Simpson trial, she finally told the story she set out to with those tapes. There's no doubt that McKinny had a huge impact on the trial. As reported by CNN, a screenwriter at the time, McKinny testified that she was considering writing a film about women in law enforcement. She met then-Detective Mark Fuhrman and started taping a series of interviews with him, claiming she wanted to hear Fuhrman's words for screenwriting purposes. The transcripts of her interviews came out in court, in which the detective made racist and sexist remarks and repeatedly said the n-word. As reported by the Los Angeles Times, because Furhman had previously testified that he had not used the word, he was charged with perjury and pleaded no contest. He was sentenced to three years of probation and fined $200. Clearly, all of that material McKinny collected wound up having an effect on the trial, but that wasn't its only place in American culture. Last year — 20 years after the conclusion of the Simpson trial — McKinny did publish a novel, Men Against Women . As expected, it's about the very topic McKinny said she was researching during her interviews with Fuhrman: It follows a female cop who runs afoul of a "Men Against Women" group in her precinct. "I recently published Men Against Women, which is the book from where the tapes came," McKinny says. "I had interviewed men and women officers to develop a story that reflected what was happening with men and women in policing in the mid-'80s in the Los Angeles Police Department. It’s those tapes — some of those tapes — that were subpoenaed." Since those tapes were recorded decades ago, you may be wondering why Men Against Women was just published in 2015. As McKinny explains, the story went through many phases and faced quite a few hurdles. She actually originally envisioned it as a documentary, but realized "a lot of the research was not conducive for documentary work at that time." Instead, she "decided to use the information to write a screenplay that would reflect some of those same issues." Still, this change happened well before the Simpson trial, and it turns out, the trial was one major cause of delay. "The tapes were subpoenaed after the screenplay had been optioned, so really the whole circus of the exposure to the O.J. Simpson trial made it impossible to move that project forward in any reasonable fashion," she says. That influenced McKinny to change the story from a screenplay to a book, adding, "I made that decision because I felt that the story deserved that amount of work." In 1999, she received a two-book deal with Bantam Books, working closely with a senior editor named Beverly Lewis to revamp the story. Tragically, Lewis died that same year, and as McKinny explains, "after she passed away, the book passed away," and Bantam decided not to pursue the deal any longer. At that point, McKinny decided to get her MFA in Creative Writing from Queens University and "completely revise" Men Against Women using Lewis' notes from their time spent working together. ("[Lewis] taught me a lot about writing in an interesting way," she says.) "By the mid-2000s, I had the book and was ready to go," McKinny says. However, tragedy struck again, as her husband began suffering from strokes before eventually passing away of cancer. Then, in February 2014, she was discussing the book with her son when he said, "Mom, you have to publish this ... This is a really good story and you have to publish it." And, finally, she did. As if that didn't keep her busy enough, McKinny also has a film company, Stone's Throw Films, which Amazon lists as the publisher of Men Against Women. Her bio on the website explains that she has had her hand in a number of projects, and she tells Bustle that one of her sons is actually her business partner at Stone's Throw. In addition to her work there and on her book, McKinny says that she works full-time teaching screenwriting at the University of North Carolina School of the Arts' School of Filmmaking. "It’s fabulous combination of stories, because I’m a storyholic," she says. "It’s a great opportunity, I get to work with my students to help them realize their storytelling potential and I get to generate stories that help people connect and work with one of my sons and I couldn't be more fortunate."